2014 is going to be a critical year – we need your help in asking current legislators to support the Insurance Fairness for Amputees Act in Congress and in your state. It is also a chance to approach those who might be running against an existing legislator for their support if they are elected in November. 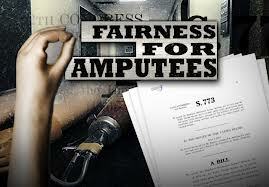 The insurance Fairness for Amputees Act has the potential to provide immediate benefits to ALL members of the limb loss community by ensuring that if an insurance company …covers prosthetic and custom devices that they cover them without arbitrary caps or restrictions and that the coverage must be equal to other benefits in the policy. Contacting legislative or campaign offices and going to town halls and asking for a campaign’s support of the legislation can help advance the Insurance Fairness for Amputees Act 2014 and beyond.There are many other issues and causes that you may find important. Some of those issues may relate to being an amputee, and some may be unrelated, but now is a great time to get involved in advocating for your interests. One of the best ways to impact legislation and policy is to work with candidates that you support or who support your interests. In working for a campaign, you may often be able to work with others to help craft decisions on issues that you’re interested in. Even in years when we do not have a presidential election, it is important to remember that individuals can make a difference.YOU CAN MAKE A DIFFERENCE.You can also get others to help you make a difference if you’re able to engage your family and friends, your support group(s) or your prosthetist’s office into helping. Once you’ve gotten involved, then you can leverage the support you receive for specific issues, which can result in positive results for amputees in your community and throughout the country. Excellent information. Thanks a lot! Thanks a lot! Loads of info! Tm21Vb I will regularly upload tons of stock imagery but I?m not sure what to do about the copyright issue? please help!.. Thanks!. Hello there, You’ve done a fantastic job. I’ll certaknly digg it and personally recommend to my friends. I amm sure they’ll be benefited from this website. Less expensive Essay Composing Assistance 24\7,Custom made Admissions Essay 2014 Deciding to buy a paper for reasonable. Nice. And with that all you have to do is to use the same vision to your “audio” features or hourly playlists! jy8TPf You, my friend, ROCK! I found exactly the information I already searched everywhere and just couldn at locate it. What an ideal site. 6L7qQX Keep up the superb work , I read few posts on this web site and I conceive that your web blog is rattling interesting and contains bands of great information.